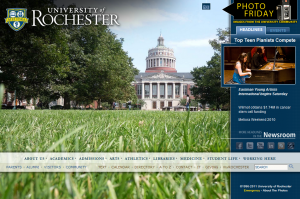 A little more than three years ago, in September of 2008, a new redesign of the University’s homepage was launched. launched in 2006 — was itself a complete overhaul of the site that came before it. 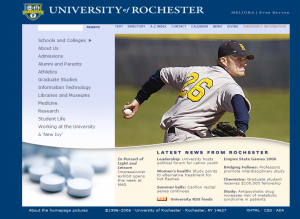 The trend in Web design however is away from these months-long redesign projects and toward what is referred to as “iterative design” or “progressive enhancements.” Happily we are no stranger to this philosophy at the UofR, and we have an even better name for it: Meliora, Ever Better. Over the last few weeks, we have been marking several special occasions on our homepage, beginning with the 10th anniversary of September 11, and continuing with the YellowJackets appearances on The Sing-Off, Meliora Weekend, the Meliora Challenge kick-off, Halloween, and our popular Photo Fridays. For these special editions we found that having a more flexible homepage that didn’t require a photo of a specific size for example, or a fixed sidebar, came in very useful for keeping us nimble and responsive. Today marks the beginning of a month-long beta period for the homepage in which we’ve incorporated some of the enhancements we’ve made to accommodate these special homepages into our everyday Web presence. During the month of November, we’ll be conducting usability tests with students, faculty, and staff (and prospective students, ideally) writing regular blog posts describing some of the changes, and gathering feedback. Please use this blog to let us know what you think. This entry was posted in beta, iterative design by Lori. Bookmark the permalink. Just testing to see if comments are turned on. Hello! I don’t often go to the main web site, but have noticed the change. Very nice. Interestingly, I didn’t even notice that the new page is really quite LONG – I missed the scroll bar at the right. With such wonderful photos drawing the eye, it is easy to miss. Also, “what? no dropdown/flyout menus?” I’d be interested to know how you decided to do that, since I had thought one of the goals was to be able to access pages with the fewest number of clicks. I think the fonts are a bit small in the top menu. A bit too unobtrusive. I agree with above comments about the scrolling. I’m especially surprised to see the capital campaign logo always down below and almost always requiring scrolling. I’m also puzzled by the small font at the top. The photos are very pretty, but overall it seems less functional than before. Overall, I like the use of more transparent web page elements that allow the large photograph to show through them in a semi-transparent way. It gives a nice depth to the page. The home page is also fairly distinctive when compared/contrasted to other home pages of other universities. I think the size of the school logo and the font size of the links at the top should be a little larger. I know you want to make an impact with the photograph, but I think the words at the top need to be brought out a little bit more. My favorite size photograph was one from the Memorial Art Gallery (A panoramic view of Fountain Court, the home of the Memorial Art Gallery’s Italian Baroque Organ). The vertical length of the photograph was much shorter than the other ones and made the page less long. I don’t necessarily think the web page is too long in and of itself (as other home pages are very long and work well), but there is little to draw the viewer to the bottom links. Unfortunately, when the photograph is very long in vertical length, it serves to almost bisect the web page horizontally. I personally would either (1) keep the vertical length of the photographs on the shorter side and select photographs that lend themselves well to that format or (2) incorporate some type of design element that draws users down below somehow. Finally, I would be a little more selective about which photographs are posted frequently on the web page. Some photographs look amazing, while others just seem okay. I think Photo Friday is the best time to let loose and let lots of things fly, but most other days I would be more selective of what is posted and focus on wowing or perhaps intriguing prospective students. Those are my thoughts. I think the overall design is pointing in a very nice direction. It is very easy to edit the hard work of others, so please take my suggestions for whatever they may be worth to you. I can tell you put a great amount of thought and effort into the redesign. Great work! The Meliora Ever Better and the search magnifying glass icon colors do not seem to contrast well with the background. The use of black textbox for search and black transparent overlays for menu and news, makes the site look less bright and more deeper/darker IMHO. Because of the placement of the search box and the phone directory link, it is possible that the search could be perceived as search of the directory. All this nit picking aside, I LOVE our website. Awesome work! I think the need for scrolling is annoying and seems unprofessional. That was the main thing I noticed and the reason I thought to comment. Otherwise things seem fine. Everyone seems to have some criticism of the scrolling necessary to access information at bottom in the current format of the homepage, and I agree that something should be done to make that more obvious (e.g., make the vertical dimension of the photos smaller as suggested, either by cropping or reducing, so you can see the upper part of the lower half of the screen). Also agree that the photos should be really high-quality, and/or visually striking. Keep the standards high for these pictures. My biggest beef is that the color scheme is very dark and a bit depressing, at least compared to the last website iteration. The header background shows up almost black on my color-calibrated screen. As mentioned, the “Meliora ever better” text lacks sufficient contrast to attract the eye, to the point of almost missing it altogether. The resolution of the University shield is also too low, and it’s a bit small and too unobtrusive. Otherwise functionality is really good, keep up the great work! I miss the quick link to the academic calendars. I had to search for it instead which was unexpected. But other than that I like it! I’m sorry to say I’m really not a fan of the new look for the homepage. I enjoyed the uniqueness of the 2008 design with menu bar spanning across the page, instead of the traditional menu being at the top of the page. This new homepage looks incredibly boring to me and no longer stands out in my mind from other institutions. Truly a creative regression in my opinion. The text is too small and no longer stands out like it once did in caps. Please move the myRochester link to the top right if you decide to keep this new design. It’s a real pain in the neck to scroll down for it all the time. I think the redesign is terrific. I’m sure there are things to tinker with, as noted in some of the comments, but overall it’s fresh and compelling. The redesign of the Athletics section inside is awfully good as well. Just a comment about coloring. Please be careful about the small blue text on the dark blue background. It is very hard to see/read. Especially on the home page where you really want to draw people in. I agree with others who don’t like having to scroll to see the links on the bottom of the page. I really hate the overall dark feeling of the new home page with so much navy blue. The fonts on the horizontal menu are too small, the “Meliora, ever better” does not stand out and I think the text box superimposed on the photo is hard to read because it is transparent, yet it obscures the photo. Additionally, I don’t like the lack of pull down choices – now more clicks are needed to find the page I want. I also don’t like the individual sports pages under athletics. they generally look too cluttered because of the photo backgrounds and the way the space is broken up. The horizontal white bars of the upcoming events are really bright and dominate the page. I would rather see recent headlines closer to the top and upcoming events off to a right column. In general, I don’t like dark backgrounds with white writing – too harsh on the eyes. I think yellow would be easier on the eyes, but I prefer soft black or navy on a pale background. Financial Aid needs its own link from the front page, or perhaps label it with Admissions/Fin Aid. One has to guess where it is. Is it under Academics, is it under Admissions? And why is it under admissions, as this only applies to incoming Freshmen and women? It would be best to give it its own link. I think the need for scrolling is annoying. I think the redesign is fresh and compelling.